Building up gradually from first principles, this unique introduction to modern thermodynamics integrates classical, statistical and molecular approaches and is especially designed to support students studying chemical and biochemical engineering. In addition to covering traditional problems in engineering thermodynamics in the context of biology and materials chemistry, students are also introduced to the thermodynamics of DNA, proteins, polymers and surfaces. 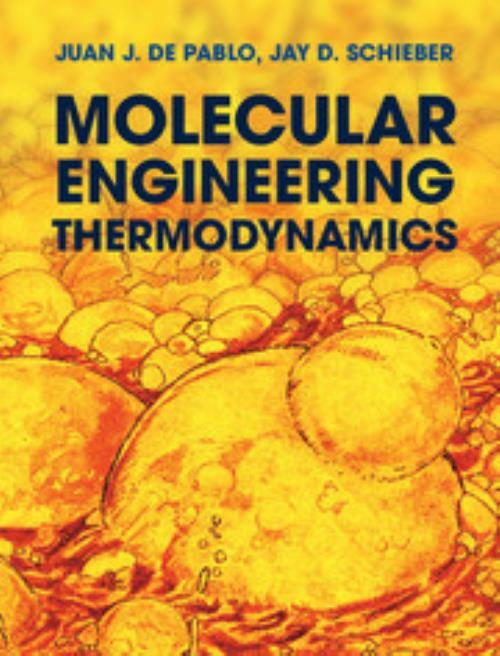 It includes over 80 detailed worked examples, covering a broad range of scenarios such as fuel cell efficiency, DNA/protein binding, semiconductor manufacturing and polymer foaming, emphasizing the practical real-world applications of thermodynamic principles; more than 300 carefully tailored homework problems, designed to stretch and extend students' understanding of key topics, accompanied by an online solution manual for instructors; and all the necessary mathematical background, plus resources summarizing commonly used symbols, useful equations of state, microscopic balances for open systems, and links to useful online tools and datasets. 12. Thermodynamics of surfaces; Appendix A. Mathematical background; Appendix B. Fluid equations of state; Appendix C. Microscopic balances for open systems; Bibliography; Index. Juan J. de Pablo University of Chicago. Juan J. de Pablo is the Liew Family Professor at the Institute for Molecular Engineering, University of Chicago, and a former Director of the Materials Science and Engineering Center on Structured Interfaces, University of Wisconsin, Madison. He has won several teaching awards, been awarded a Presidential Early Career Award in Science and Engineering from the NSF and is a Fellow of the APS and AAAS. Jay D. Schieber Illinois Institute of Technology. Jay D. Schieber is Professor of Chemical Engineering in the Department of Chemical and Biological Engineering and the Department of Physics, and Director of the Center for Molecular Study of Condensed Soft Matter, at the Illinois Institute of Technology. He has been a visiting professor at universities in both Europe and Asia, holds numerous teaching awards, and was the 2004 Hougen Scholar at the University of Wisconsin, Madison.